Looking to jet off on holiday to the sun? Or perhaps you're a business traveller looking for the best in quality and value? Whatever your reason for flying, a Singapore Airlines code can help you get to your destination for less. Whether you're on a gap year adventure to the beaches of Thailand or a business class flyer looking for a luxury airline, a Singapore Airlines code will save you money while you shop. Singapore Airlines has a rich history stretching all the way back to 1947, when a Malayan Airways Limited Airspeed Consul began undertaking three flights a week between Singapore's Kallang Airport and Kuala Lumpur, Ipoh and Penang. Over the years, larger aircraft were launched and new destinations were added, with the company extending their services across Indonesia, Burma, North Borneo and Sarawak. Today, Singapore Airlines is a market leader servicing destinations around the world, with a focus on trail-blazing innovation and many market firsts. Singapore Airlines have always been at the forefront of commercial aviation. In 2007, they launched the world's widest First and Business Class full flat seat, as well as the next generation of their award-winning in-flight entertainment system. And in 2008 they made history again by becoming the first carrier to operate an all-Business Class service from the Asia to the USA with its non-stop services to New York and Los Angeles. Singapore Airlines offers a fantastic on-board experience no matter what Class you are flying. Economy Class boasts excellent value for money with increased personal space, in-flight meals and a state-of-the-art entertainment system, while Premium Economy offers superior seats and a gourmet meal selection. Looking to really travel in style? Business Class boasts cleverly designed seating booths that offer more comfort and privacy to business travellers, while long-haul Business Class has seats that transform into fully flat beds. First Class really is something else – one of the best of any airline – with a personalised gourmet menu and one of the most spacious seating and sleeping areas around. Or why not go all and book a Singapore Airlines Suite? Boasting a luxurious seating area with comfortable armchair and a separate sleeping compartment with a full, fixed bed, these suites are an incredible way to travel whether you're discussing business or celebrating a special occasion. Want to book your next flight with Singapore Airlines? With a Singapore Airlines code you can enjoy fantastic savings on flights between top destinations around the world. So whether you're headed to Singapore on business or looking for a cheap and cheerful budget option between Asian cities, a Singapore Airlines code will help you save the pennies. State-of-the-art entertainment system and on board meals and drinks in all classes. Browse our website until you find a Singapore Airlines code that suits you, then navigate to their website to begin shopping. Enter your desired flight details. Enter your Singapore Airlines code in the box provided and click 'Apply'. Want to find out more about flying the world in style with Singapore Airlines? Why not pay a visit to the company's dedicated YouTube channel? You'll find lots of exclusive content including video tours, destination guides, travel tips and more. You can also use this channel to find out more about saving money with a Singapore Airlines code. If you've enjoyed travelling with Singapore Airlines, you might also like to check out more great deals on flights around the world with companies like Ryanair or TUIFly. Or, if those aren't right for you, you'll find plenty more deals to browse in our Travel section. Choose your flights and click 'Continue'. Review your booking and click 'Continue'. Enter your passenger details and click 'Continue'. Need to speak to the team at Singapore Airlines? Whether you have a question about your booking, want some assistance planning your journey or simply want to find out more about how you could make fantastic savings with a Singapore Airlines code, you can contact the Customer Services department by telephoning 020 8961 6993. Want to discover more from Singapore Airlines? The company maintains a profile across all your favourite social media networks. Follow them to enjoy access to lots of interesting content including video tours of Singapore Airlines aircraft, industry news and gossip, tips on what to do in destinations around the world and much more. You can also use these pages to find out more about saving money with a Singapore Airlines code. Don’t forget to check them regularly, as you can never be sure when a free Singapore Airlines code might be waiting for you! 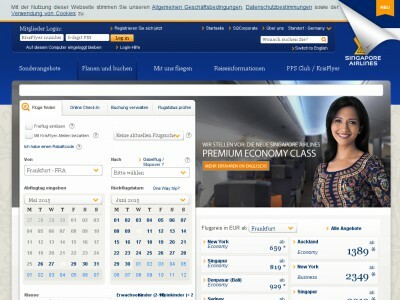 Buy now online at www.singaporeair.com. When I was booking flights for my honeymoon, I wanted the very best – but didn't have a fortune to spend. Luckily, I discovered a Singapore Airlines code online. With a Singapore Airlines code you can get amazing deals on flights all around the world on one of the top airlines at singaporeair.com. I used my Singapore Airlines code to book seats from London to Bangkok in Thailand – and managed to stretch our budget to Premium Economy too! So why not travel in style for less with Singapore Airlines code?